For long suffering residents of Sweden, Sunday's vernal equinox brought with it celestial proof that spring is indeed on its way, contributor Tom Callen writes. Sandwiched halfway between the shortest day of the year (December's winter solstice) and the longest (June's summer solstice), the vernal equinox is proof of Earth's motion around the Sun and more importantly for those of us who live at high northern latitudes, that warmer and sunnier days are finally on their way. The word “equinox” sounds very much like “equal” and has in fact that meaning; days and nights are now roughly about the same length in hours and the coming days will get longer and the nights shorter as we head toward summer. In short while the northern hemisphere looks forward to summer, the southern hemisphere has their autumn and winter ahead. Though it is now astronomically spring there are still many traditional winter constellations visible beginning in the southwestern part of the night sky, but their days are numbered. Looking at the color sky map we can see one of the westernmost of these, Canis Minor, at its upper right edge. 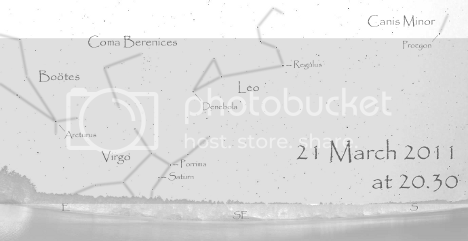 With the coming of spring we have other constellations related to this annual time of renewal. Leo, the Lion, is one of the most dominating figures of the season and he is easy to find; just look for the large backwards “question mark” in the southeast. Some liken its shape to the harvester's sickle used to cut stalks of ripe grain. However you find it, that question mark is the lion's mane (the curve), chest (the straight line below the curve) and heart (the bright star Regulus that is the question mark's period). The reclining right triangle to the left is the haunch of the lion's right leg so this maned majesty's final appearance looks not unlike the Great Sphinx of Giza in Egypt. Regulus, which means “little king,” was supposedly named by Nicolaus Copernicus (1473 – 1543), the same astronomer who re-proposed that the Sun was the center of the solar system and that the planets orbited it. Appearing single to the eye Regulus is actually two pairs of stars in orbit around each other. Since this bright star lies so close to the plane of the solar system it is often occulted, or covered, by the Moon as it moves through this part of the sky; it can even more rarely be covered by the planets Mercury and Venus and even more rarely still by some asteroids. Denebola, the brightest star in the triangle that marks the lion's right haunch, has a name that actually tells us something about its position. It is derived from an Arabic phrase that means “tail of the lion” and in verbal descriptions of this group Leo's tail loops down from his body and then up again with Denebola marking the tufts at its tip. Saturn lies low in the east southeast this time of year near Virgo, the Virgin's, star, Porrima. If you look carefully you will note that while stars twinkle, or scintillate, due to turbulence in Earth's atmosphere, the planets do not. Watch yellowish-white Saturn over the coming weeks as it appears to slowly move closer to Porrima, a combination of the ringed planet's and our own world's motion around the Sun. While looking at this part of the sky your gaze might easily be captured by the colorful and dazzling Arcturus in Boötes, the Herdsman. Believe it or not planetariums receive many calls this time of year from people seeing “UFOs” in this part of the night sky and more than likely the culprit is Arcturus, which may hold the record for being the one celestial object most confused for an extraterrestrial spacecraft. But like the other stars it is merely scintillation that provides this annual light show. Arcturus' light was used to open the World's Fair held in Chicago in 1933. Focused onto a photocell at the inaugural ceremony it signaled the grand opening. Unfortunately the Fair's organizers had been erroneously told that the light from Arcturus seen in 1933 had left at about the same time as the previous world's fair (1893), which was also held in Chicago. However, being 36.7 light years away its light had actually left in 1896 and not in 1893. No matter, the public of the day was greatly impressed with this feat of modern technology all the same. Last, and certainly least in this case, is the faint group known as Coma Berenices, the Hair of Bernice. Laying between Leo and Boötes it becomes more interesting if you sweep across it with a pair of binoculars. By doing so you'll then be able to see a myriad of stars that are, according to legend, supposed to be the silky tresses of this ancient Egyptian beauty. Though the modern constellation itself did not come about until the 16th century. 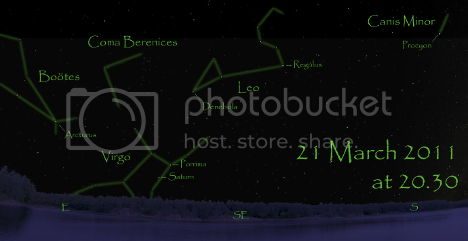 Besides March 21st at 8.30pm the sky map can also be used in the weeks ahead - on March 28th at 8pm and April 4th at 7.30pm. Protect your night vision by using a lit flashlight with a piece of red gel taped over its lens, or by putting your flashlight into a red plastic, or a brown paper, bag. These will help cut down on the flashlight's brightness yet allow you to see the black and white version of the sky map that you can print out to take outdoors.